DAMASCUS, Syria – Vladimir Putin - a dapper, cloak-and-dagger Russian politician and Karate teacher - met with all two reporters at a press conference organized in Moscow strictly for members of the American media not in cahoots with PNAC. Putin told the pair, which included us, that all peace-loving denizens in Syria and the world should start demanding air strikes against "Mad Dog" John McCain in order to force the pathological warmonger to put up OR shut up! The Russian Prime Minister President and Commandant told the media, “Although Syria has not been what you might call cooperative with terrorists, still the suppression of terrorism is not a crime in Syria or in Russia, where law enforcement must be maintained.” He was referring in part to the bloody Western-backed terrorist attacks, particularly in the city of Homos, which have been decried by Dr. Bashar al-Assad and his pro-gay administration. Meanwhile bomb happy misanthrope John McCain ordered the United Nations on the US Senate floor to carpet bomb Homos back to peace and property. “The only realistic way to achieve calm and happiness is with foreign air-power,” McCain said. “Through blessed air strikes the United States should lead an international humanitarian effort to decimate key population centers in Syria, especially in the North, West, East, and, ah, what was the last direction?” - the tortured old war pig asked us. Sheesh! How should we know? We think McCain’s comments are pathetic. Not only are his words totally insane -- as the mad senator has said before that the world is too soft on war -- they are also a suicidal cry to finally launch the ever-itchy Apocalypse. McCain has also opined that the US should change its policies, starting with re-arming al Qaeda -- again. 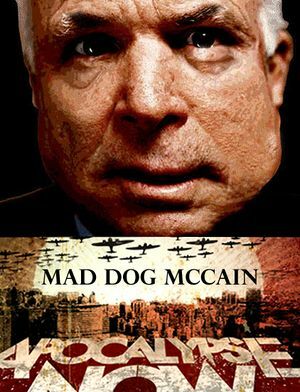 While Mad Dog McCain demanded blood and guts, coincidentally the US and European governments pleaded with Vladimir Putin to renege his anti-war stance on Syria, Iran and the world. 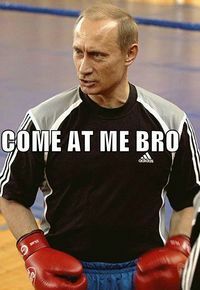 But the stubborn Russian pacifist was unmoved. We at UnNews think Vlad VS Mad Dog would be a great match up. Especially if it's promoted by Don King. Because then we could all have the satisfaction of seeing first hand that McCain is finally retired from active duty. This page was last edited on 5 June 2012, at 07:36.